This is a custom built home with recent upgrades to include new furniture, bed linens, kitchen equipment and décor to further enhance your stay. The house is directly across the street from beach access and enjoys wonderful views of the ocean and is only a few short blocks from the center of town. Our 3600+ square foot three story house has all the furnishings you will need to enjoy a week away from it all. The high lot and elevated construction allow for wonderful beach and surf views from each floor of the house. With five additional porches located throughout the house totaling almost 1500 additional square feet, there is plenty of indoor and outdoor gathering places. Located only three blocks from downtown Folly Beach, this allows for walking into town for entertainment however located just far enough away to escape most foot traffic. The first floor contains a majority of the entertainment space including a custom kitchen with all state of the art appliances, a large open floor plan with an open dining room and family room area and a large flatscreen HD TV. There is a half bath located just off the kitchen/dining room. The large front porch allows for plenty of room to entertain, people watch and relax. Rocking chairs included too! Also on the side of the first floor space is a huge screened in porch featuring seating for 16 in two separate seating areas, a grill, a wonderful outdoor tiled shower and an enclosed private bathroom. This is the place where most people tend to gather and enjoy the sound of the surf and views of the beachfront. Additionally on the first floor, you will find one of two master bedrooms including a huge walk in closet and a large custom private bathroom. Also found on this floor is the laundry room. The second floor features two over sized bunk rooms. Each bunk room contains one Queen bed and two twin beds. One bunk room featurs two trundle beds in addition to the Queen and other twin beds and also has it own private ocean view balcony. Each bunk room contains it's own full bathroom. Also on the second floor, there is a large private sun deck to enjoy some time away from it all. Our third floor features the second master bedroom as well as a walk in closet, large bath with jetted tub, and private deck. This third floor deck area is one of the highest points in all of Folly Beach and allows for panoramic views that must be seen to be believed! An Ocean View Not To Miss from each floor of this wonderful home! There is plenty of offstreet parking that can easily accomodate 8 cars. 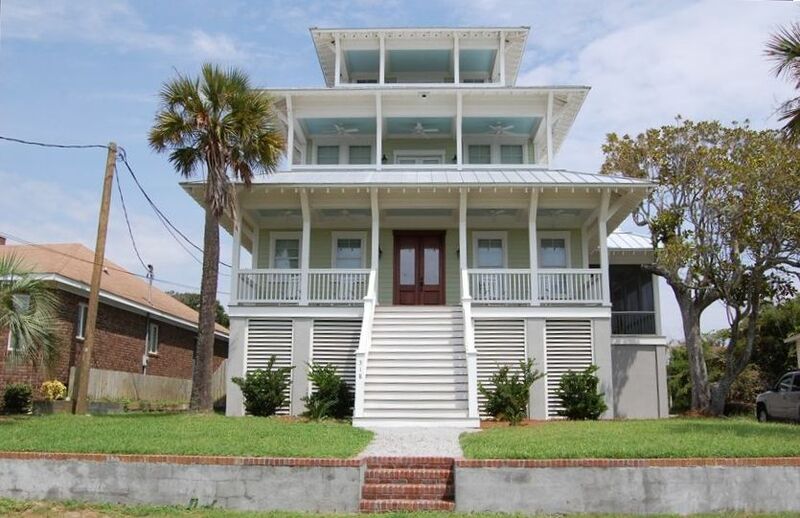 Keywords: House, Ocean View, Close Beach Access, Minutes to Downtown Folly Beach & Charleston. Our family of fifteen (everybody from g’ma and g’pa all the way thru the six littles) really enjoyed our Folly Beach vacation. The weather was superb and this wonderful house was a great fit for our whole crew. It had plenty of room and everything we needed for a comfortable stay. The owner is accessible and friendly and we highly recommend this place. Great house, clean, open, sunny and very very close to the beach! Slept 10 girls comfortably. We had a great time! Our family loves gathering in this wonderful house! The living areas lend themselves perfectly to a large group, cooking is fun in the well-equipped kitchen, and this year the weather allowed us to enjoy the spacious porch. We all love it! Me and 12 of my buddies had a guys weekend at this house and we could not have picked a better house. Easy walk to the beach (1-2 houses down for beach access) and a casual .5-1 mile walk to all of the bars in Folly. Great view from the 3rd story balcony. Would stay again if going to folly with a group.